(The Root) — Despite his Reagan-esque looks, a near-perfect family life and a vast fortune, nobody seems to like Mitt Romney that much. And as the past weeks' political postscript has been written, President Barack Obama has proved the ultimate comeback kid, winning on immigration, health care reform and personal likability. With fewer than 130 days before Election Day, the 2012 race is on. And if recent poll numbers are to be believed, Romney has a lot of catching up to do. America remains a divided country, but on a few issues public opinion is settled. After six years of running for president, Romney remains a largely undefined personality. His favorable-unfavorable ratings are at a net negative. According to a recent NBC-Wall Street Journal poll, a majority of Romney supporters — a whopping 58 percent — say that their vote is against President Obama rather than for Romney. The numbers are especially embarrassing when compared with the 72 percent of Obama's supporters who say that their vote is for the president rather than against Romney. Gallup polls in May show the president leading Romney in likability by a huge margin, with registered voters nearly twice as likely to approve of Obama as they are Romney: 60 percent to 31 percent. And when those polled were asked which candidate "cares about the needs of people like you" or "agrees with you on issues you care about," Obama continued to trounce Romney. But Romney has bigger problems than a national popularity contest. In the key battleground states, Obama has widened his lead over Romney, which has broad implications for how independent voters perceive the president's challenger. Among swing-state respondents to the NBC-WSJ poll, Obama leads 50 percent to 42 percent among people living in North Carolina, Florida, Michigan, Ohio, Pennsylvania, Virginia, Wisconsin, Nevada, Colorado, Iowa, New Hampshire and New Mexico. These 12 states will inevitably decide who resides at 1600 Pennsylvania Avenue, and the numbers just aren't looking good for the former governor. Equally troubling for Romney is that his favorable numbers in swing states have dropped, from 36 percent (with 36 percent unfavorable) in May to 30 percent (41 percent unfavorable) in June. Pollsters conclude that this is the toll taken by negative ads that Obama's campaign is using to highlight the truth behind Romney's business dealings while CEO of Bain Capital. In this weakened economy, Romney sought to win over primary voters by selling his successful career in finance as proof that he knew how to create jobs. But as simple research uncovered, what Romney did created wealth for investors and his colleagues, but often at a cost to American workers. Obama and the Democratic National Committee seized on a number of instances in which thousands of factory workers lost jobs as a result of Bain's corporate-raiding practices. Vice President Joe Biden has recently proved to be a gaffe-proof surrogate, relaying this key message to enthusiastic crowds in Iowa. "He's been very good at creating jobs overseas," Biden said of Romney, "in Singapore, China, India." Obama and Biden are successfully using Romney's own spurious claims against him by unveiling the shrouded practices of outsourcing and offshoring — the very tools that delivered Romney extraordinary returns and exorbitant wealth. 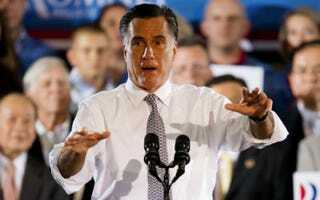 The effective Obama strategy has left Romney's campaign scrambling for answers, and with responses that are mostly nil. The NBC-Wall Street Journal poll reflects this, showing high unfavorable ratings for Romney's business background. Thirty-three percent of people said that the more they discover about his corporate-sector experience, the more negatively they view it. Only 18 percent viewed his experience positively. Como Se Dice "Etch A Sketch"? Recent Quinnipiac University polls are very much in line with the Wall Street Journal findings: President Obama has advantages over Romney in Florida (a 45 percent to 41 percent lead), Ohio (a margin of 47 percent to 38 percent) and Pennsylvania (a 45 percent to 39 percent difference). Voters in these key states support the president's recent executive directive that allows undocumented children of illegal immigrants to avoid deportation, pursue higher education, apply for work authorization and seek a path to legal status. The president's decision affects all of those who arrived illegally before the age of 16, regardless of nationality, but the measure has a disproportionate effect on Latinos — especially those of Mexican origin — who make up the vast majority of undocumented residents. Romney, who has yet to deliver an answer on whether he would rescind the president's directive, has an even deeper problem with Latino voters. During the hotly contested GOP primary, Romney "Etch A Sketched" his way to the far right by drawing a hard line on illegal immigrants, infamously concluding that they should all "self-deport." It seems that Romney was more interested in appealing to an ever-shrinking xenophobic, white-ethnic voter base that loathes "others." But that isn't a winning political strategy in a general election. Latinos now constitute the largest ethnic minority in the country and are increasingly voting for Democratic officials. Latinos, like most Americans, are also hugely in favor of Obama's other major policy achievement: health care reform. The recent Supreme Court victory has shifted the political landscape ahead of the November contest. A Bloomberg national poll shows that 58 percent of Americans oppose a repeal of "Obamacare": A plurality, 43 percent, said that they want only small improvements in the 2010 law, while the other 15 percent were happy with the legislation as is. This places Romney in a precarious position, since a debate over universal health care only serves to highlight his most significant flip-flop of all. As governor of Massachusetts, Romney supported and signed what Tim Pawlenty once called "Obamneycare." This is surely a point that Obama won't ignore in their upcoming debates, and it weakens Romney's past tagline of "repeal and replace." Especially after the conservative-leaning court sided with Obama on the issue, the only question for Romney will be "Replace with what?" That's not a question for which Romney has a viable answer. As one may expect, all polls showed Obama getting a lift from African Americans, Latinos, younger voters and women. The Republican attacks on female reproductive rights have not boded well. Neither has the anti-Latino rhetoric espoused by GOP operatives. In refusing to differentiate himself from the far right and by openly associating with Birthers like Donald Trump — as well as failing to denounce Rush Limbaugh's offensive statements about Georgetown Law student Sandra Fluke and Ted Nugent's viscerally violent comments about President Obama — Romney has displayed an inept character and lack of political posture or backbone. His willingness to appease a racist and misogynist constituency only proves that he's not a man interested in representing the broader electorate. Romney's only chances now lie with GOP attempts to disenfranchise minorities through newly enforced voter-ID laws and an incessant effort by conservatives to pour limitless amounts of money into the Romney campaign and anti-Obama super PACs. These are largely led by the billionaire Koch brothers and Bush adviser-turned-GOP rainmaker Karl Rove. Rove has already raised $30 million through American Crossroads, the PAC he established after the Supreme Court's Citizens United decision. The Kochs have vowed $400 million or more and are on course to fulfill their promise through a network of wealthy donors, many of whom are Wall Street moguls that have abandoned Obama in his efforts to reform the country's financial and mortgage markets and create a more equitable tax code. But even with multimillions being spent in key swing districts, the latest poll numbers reflect a pro-Obama nation — one in which money buys neither love nor likability. Romney must find a new way to connect with voters or else he'll march steadily on to a November defeat. Either way, health care, immigration and a changing racial and ethnic demographic may put a dent in Romney's chances to claim the White House. Edward Wyckoff Williams is a contributing editor at The Root. He is a columnist and political analyst, appearing regularly on MSNBC, Al-Jazeera and national syndicated radio. Follow him on Twitter and on Facebook.